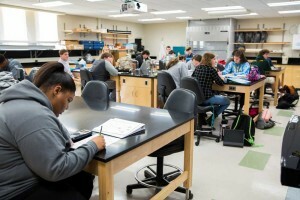 Admission is competitive and is based on previous math and science courses, teacher recommendations, standardized achievement testing, science/math activities, and honors. Students apply for admission to the Chesapeake Bay Governor’s School in the spring of their freshman year. Student selection is determined by each participating school system. The selection committees review standardized test scores, academic achievement, and demonstrated interest in science and mathematics. For more information, please see our admissions criteria page. Students interested in learning about the CBGS program should speak with their guidance counselors and attend an information session. Recruitment for Chesapeake Bay Governor’s School starts in January. The CBGS director and faculty members are available to visit the participating high schools to meet with the guidance counselors and interested students. They will bring visual aids and school literature to pass out, giving students some general information about the program. The students are invited to attend the Governor’s school campuses during school hours and monitor the classes.